Heather Dobbins sits inside Enzo Martinez’s Salt Lake City apartment and holds his baby daughter, Arriana, for the first time. 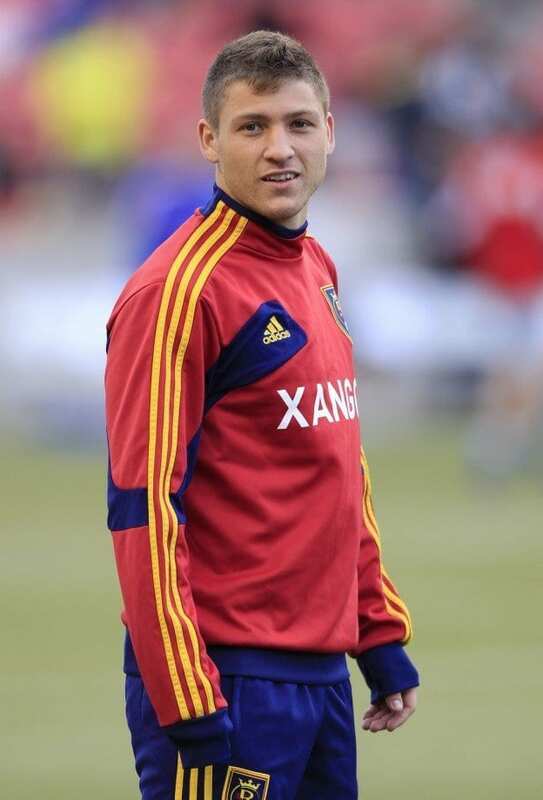 It’s the summer of 2013, and Dobbins has traveled all the way from Rock Hill, SC, to Utah, where Enzo is playing on Major League Soccer’s Real Salt Lake, just to be with him and his wife, Holly, and meet their daughter. The fact she has traveled so far just to be with Enzo’s family is really no surprise. Dobbins has always gone out of her way to care for Enzo and his brother Alex, who is only eleven months younger than him. And she has never expected anything in return. It’s difficult to describe Dobbins’ relationship with the Martinez brothers, and maybe that’s just the point—words cannot possibly do it justice. Dobbins was Enzo and Alex’s third-grade teacher at Richmond Drive Elementary School in Rock Hill. She was more than a teacher, though; she went the extra mile, day after day, to teach them the English language—there in a tiny classroom after school, just slightly bigger than a closet, where she tutored two, financially poor, seemingly misfit boys whose family had just moved from Uruguay to South Carolina, of all places. She felt endeared to Enzo and Alex, and she believed in them. She began attending their soccer games, again on her own time, to show them that she cared. Little did she know at the time that, as their relationship continued to grow, she’d also be attending their games throughout middle school, high school, college, and the professional ranks. There aren’t many lifelong friendships that form between teachers and students in a third-grade classroom, but that’s exactly what her relationship with the Martinez brothers became. This was what brought her to Salt Lake City in 2013. Enzo remembers watching Dobbins hold his daughter, Arriana, for the first time, a moment that was better than any goal she had ever seen him score. Fifteen years before, he had walked into her third-grade classroom in Rock Hill, hardly knowing a word of English. Now, his third-grade teacher had traveled all the way to Salt Lake City to meet his daughter. A week later, after Dobbins returned to Rock Hill, she went boating with three people near Greenville, S.C. While out on the water, she got caught underwater and drowned. She was only 37 years old. 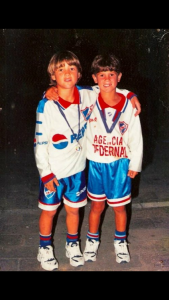 When you ask Alex and Enzo Martinez to share their own story—how their family moved from Uruguay to the States with hardly any money, not knowing a single word of English, or how they won multiple state championships in high school, or how they both went on to play soccer at top college programs, or how they both made it to MLS and play professional soccer today—they will most likely respond with a vignette about, say, Heather Dobbins. Or they’ll tell you about David Benson, who bought them their first pair of cleats in the States, and took them to tournaments in grade school and middle school, and paid for their food and lodging, and took them to church on Sundays, and introduced them to God. Or they’ll tell you about “Coach T.,” a PE teacher at Northwestern High School who was a “redneck who knew nothing about soccer” but still privately trained them and bought them cleats. The list goes on and on. It’d be impossible to tell each story without writing a book. “That’s three stories of the 20,” Enzo laughs. The Martinez brothers can go on for hours about this, and they did go on for hours about this in their interview with Sports Spectrum. Their hearts are filled with gratitude for those who helped them along the way. Some might say this is why they are such passionate people, why they are so competitive and fiery on the pitch, and why they are so driven off of the pitch. That investment starts with their parents, Carlos and Mariela. They moved their family to the States in 2000 in search for a better education for their children. They chose Rock Hill simply because some of their friends had also moved from Uruguay to Rock Hill. Things did get tough for the Martinez family. Alex says he can count on two hands the number of jobs each of his parents worked. Factories. Television installation. Construction. Et cetera. All without knowing a single word of English. It wasn’t uncommon for them to work a shift from 7 a.m. to 5 p.m., return home for a quick nap, then work another multiple-hour shift in the evening. Enzo remembers Alex once opening their pantry in the kitchen and seeing a cheap bag of chips and cookies, then running through the house screaming, “We’re rich! We’re rich!” Of course, they were far from rich. They were only becoming Americanized. “Growing up, we lived in every apartment in Rock Hill,” Enzo reflects. When Alex and Enzo started playing U13 soccer a year after they moved from Uruguay, Carlos took them to K-Mart and purchased two pairs of $12 baseball cleats. After each practice, he would make them polish their cleats and shine them. Success wasn’t defined by riches, but rather how well you took care of the things you had. U13 soccer was where the Martinez brothers got connected with David Benson, a kind, generous lawyer who had a son named Robbie on the team. Benson took Alex and Enzo under his wing (as did many of the parents) and welcomed them into his family. Alex and Enzo’s parents would try to give Benson money whenever they returned from a trip—for gas or food or lodging—but Benson would always decline. He was happy to help. Like a father might do, Benson taught Enzo and Alex all kinds of things. There were practical things that he taught them, like calling people “Mr.” or “Mrs.” or “Ms.” and to say, “Yes, sir” or “Yes, ma’am.” (“Here in the south, that’s how you do it,” he told them.) Then there were spiritual and relational things. On Sundays, Alex and Enzo would attend church with the Benson family, at Westminster Presbyterian Church in Rock Hill, then go to their house in the afternoons where Benson would grill burgers while Alex, Enzo, and Robbie played soccer in the backyard. Before the Bensons, the closest Alex and Enzo had been to a church was the one that sat four houses down from their home in Uruguay. They’d go play soccer at the church because it had a couple of posts on the property and a fence that made a nice goal. Then, the only reason they went near the church was to play soccer; now, a family that they met through soccer was taking them to church. It wasn’t so much the church that led them to a deeper faith, however; it was the people who loved them and cared for them. What’s interesting is that what Benson and Dobbins and others were doing for Alex and Enzo was a reflection of what God does for us—meeting us right where we are, not as we should be. Enzo and Alex might have been hardly able to carry on a conversation in English or afford to play soccer, for that matter, but they were not ostracized or alienated—rather, they were embraced and accepted, though they had nothing to offer in return. And whereas things might have still been difficult for the Martinez brothers financially or academically as they continued to get acclimated to a new culture, their soccer abilities were beginning to shine, not only on a local level but also on a national level. Playing for Discoveries SC and Northwestern High School, the Martinez brothers helped put Rock Hill, S.C., on the map. They won a national championship at each level along with three state championships. Enzo finished his high school career with 182 goals, the most in South Carolina high school soccer history, and was named the ESPN Rise High School Boys’ Soccer Player of the Decade. After Enzo graduated, Alex totaled 80 points (31 goals and 18 assists) his senior season. Following historic high school careers, Enzo signed with the University of North Carolina, and Alex signed with High Point University. Enzo played three years with the Tar Heels, scoring 22 goals in 72 matches, and won a national championship his junior year before being drafted 17th overall by Real Salt Lake in the first round of the 2012 MLS SuperDraft. 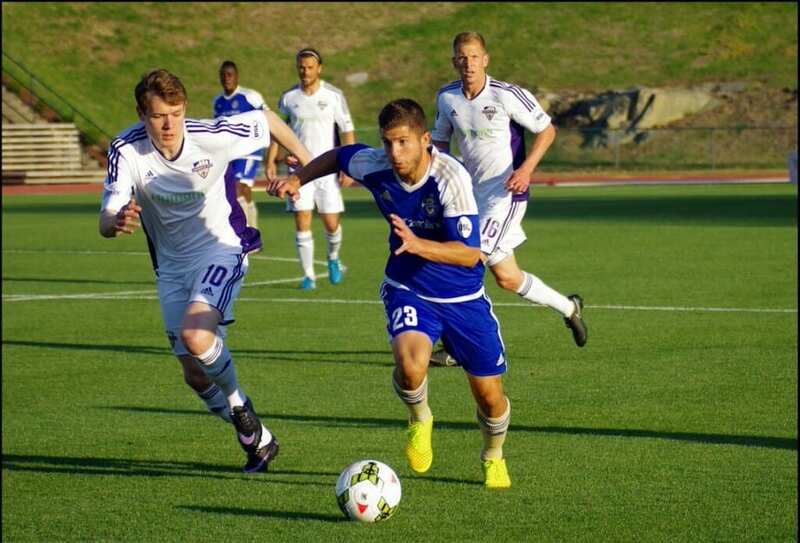 Alex played two years with High Point before losing his scholarship and transferring to North Carolina State, where he earned All-ACC first team honors and became the first Wolfpack soccer player in 20 years to notch double-digit goals and assists in a single season. 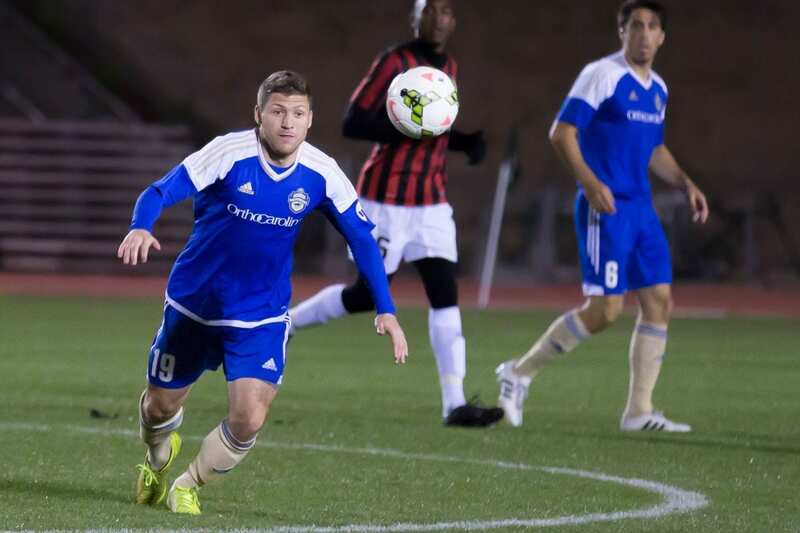 His breakout years at N.C. State positioned him to get drafted in the third round of the 2014 MLS SuperDraft by Sporting Kansas City. The offseason heading into the 2015 soccer season, a deal was arranged to bring both Enzo and Alex to the Charlotte Independence, just 45 minutes from their hometown of Rock Hill, a town whose people have impacted them in the most profound ways, who nurtured them and strengthened them, believed in them and released them into the world—and now, are welcoming them back again. And, though it’s their first time playing on the same team since high school, which is a neat story in itself, what’s even more special for them is once again being around the people who they love the most, to give back to a community that means so much to them. When Enzo was in high school, he once took a class called “Teacher Cadet,” which allowed students to assist a teacher at any school for six weeks to learn more about being a teacher. Enzo, of course, chose to help Mrs. Dobbins at the local elementary school. Dobbins took him into a kindergarten class where he witnessed two brothers from Spain scurrying about and playing around. They were poor, knew little English, and were the same age that he and Alex were when they came to the States. Enzo talked to his future wife, Holly, and Alex, and they decided to see if they could collect some money so that they could get the kids a Christmas gift. They also sought out other less fortunate families so that they could get them a Christmas gift, as well. They raised $400 to $500, purchased a number of gifts, then loaded them in Holly’s Ford Explorer and personally delivered them to each family. These experiences also led the Martinez brothers and Holly to start a fundraiser called “Kicking For A Cause,” a soccer tournament that raises money for less fortunate families. 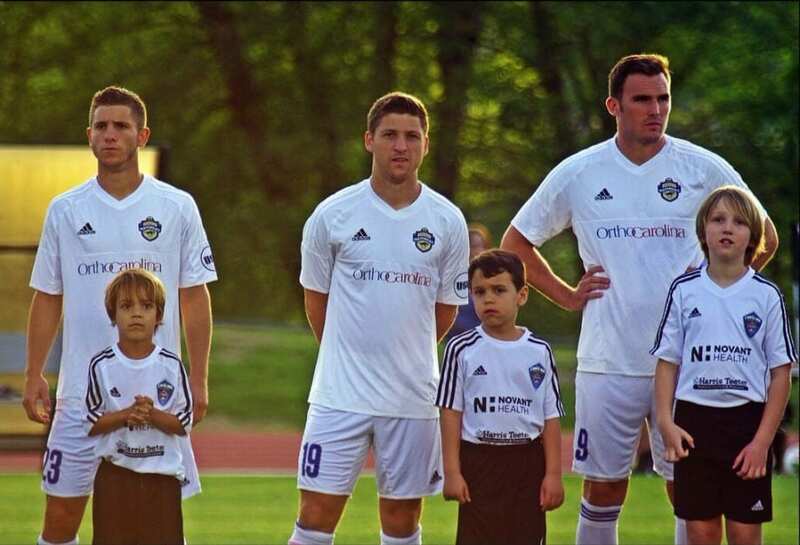 Their Christmas tradition and Kicking For A Cause became difficult whenever Enzo and Alex were drafted into MLS, but being back in Rock Hill playing for the Charlotte Independence plugs them back into the community again. “When you’ve been so blessed with so much, how can you not go out there and give it everything you have?” Alex says. The Martinez brothers are a reminder that when you focus on all that’s been given to you—the people that God has placed around you, the blessings, the grace He has lavished upon each one of us—it is only natural for that grace to overflow. Alex and Enzo Martinez choose to look up. And maybe that’s why it’s so natural for them to talk about the blessings flowing down. 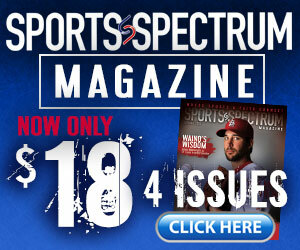 Stephen Copeland is a staff writer at Sports Spectrum magazine. This story was published in Sports Spectrum’s Summer 2015 DigiMag. Log in HERE to view the issue.